He is fighting his battle of Marriage. He is winning it Step By Step…. When you fight a battle against your wife – you are not fighting her, you are fighting against an entire system that is framed against you. Here’s sharing from a man who got 498Aed in his second marriage. He did not lose despite losing his father to it. He chose to FIGHT. And he is winning it slowly. If you are fighting one of your own, read this and choose for yourself. Disclaimer: I am not revealing the identity of this man since he is yet to win his 498A. But it’s a story worth sharing. We would bring his interview again once he wins the last leg of this battle too. We are sure he would!! 1. Share with us your case briefly, when did you get married, why did the marriage break down and when were the cases filed. Mine is a 2nd marriage. First wife had an affair with a colleague in her MNC. She went abroad, never came back. Came to sign MCD(mutual consent divorce) only. Married 2nd time in March **** in ******* , and got married to a 498a girl i.e. she filed full package on her first husband too ( i was unaware of all of this as even i do not know that there is something called 498a in this world. Anyhow, got married with her. She started her tantrums from day1. She wanted me to take liability of her mother permanently and spend money on her. I got job in 6 different countries with excellent package, but her mother interfered and wanted to join us on DEPENDENT Visa. I insisted to take her mother only on Visitor visa for short duration but my wife and her mother were forcing me for Dependent Visa, which triggered them and they created ruckus at my home 2-3 times, called neighbors and my father could not tolerate this and one day he passed away due to cardiac arrest. After 20 days of his death, she filed 498a FIR in *****. Then after 14 months of separation she filed DV(Domestic Violence) case. Above all she has a daughter from her first marriage, i was ready to accept her daughter. She wanted my parents either to transfer the property to her and kid or declare them as Legal Heirs via civil suit. She prepared the civil suit documents which we even accepted to sign but her over aggressiveness alerted us and finally my parents denied to sign the documents. 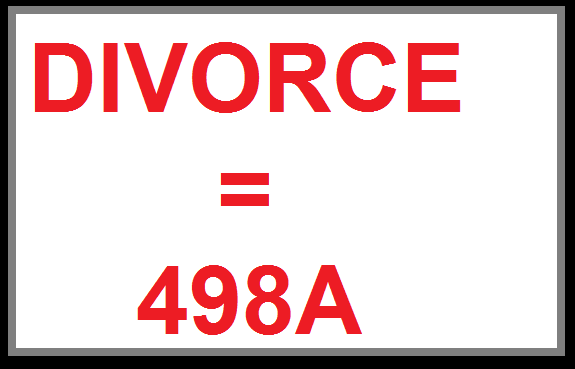 This was also the reason for filing of 498a. Infact i got her kid admitted in top notch school at Gurgaon, paid almost 1.2 lakhs and still 498a was filed on me and my mother. 2. Was a 498A filed on you as well? If yes, how many family members of yours were implicated? Did you have to go to jail? How long and how did it affect you as a person? Yes 498a is still going on . It is at evidence stage. Me and my widow mother (67 yrs old) have been made accused. Yes, i surrendered. I spent 3 nights in Jail. As a person it made me strong and now i cannot trust any woman. I took a decision to fight each case and not to surrender in front of legal terrorism. 3. Were you asked to settle the case by your wife? What did she demand to settle? Yes, 50 lakhs. She took 6 lakhs from her first husband also. 4. When and why did you decide that you will fight? Is it easy to fight? After filing of FIR, when first time my bail got rejected from Lower court on baseless allegations, I decided to fight this nonsense. No it is not easy to fight. One needs to devote time, as i do not depend on my lawyer. 95% work is done by me and 5% by my lawyer. Its a time consuming and moreover being a part of IT industry, i hardly get time. Still I am managing it anyhow by working 20 hours a day almost. 5. You have recently got your domestic violence case dismissed in the court of law. How were you able to achieve that? The petitioner i.e. wife did not came to court even once. I started taking plea in front of judge to dismiss the case in default. After 3-4 hearings the hon’ble judge dismissed it in default i.e. DID. After this she filed an application to re-open i.e. restore the case which has been dismissed recently on merits. 6. What would your advice be to the people who get a false domestic violence case filed on them? What are the important things to be kept in mind to prove your innocence in these cases? Important thing is to fight case on merits. Do not lie in courts and bring your good deeds in front of judge and show her bad conduct to the judge. It really helps even in getting dates from courts as per one’s wish. 7. In a lot of these cases, women demand maintenance despite being educated, qualified and earning themselves. Does the court look into merits of the case or DV orders are also passed in a mechanical way? My case did not go to such stage, but i have noticed that DV orders are passed in a mechanical way IF the respondent i.e. husband do not fight the case properly, There are lot of strategies which needs to be adopted to bring the truth in front of Hon’ble judge. If one depends on lawyer, he is surely gonna fail. 8. What would be your generic advice to people who are implicated in false matrimonial cases? I have been actively involved with activities of SIF(save indian family). After fighting my own cases and meeting so many victims of false cases, my advice always is to FIGHT the case and not to settle at any cost. Fighting actually brings down morale of the girls parents including girls and they sometimes come to settle cases on 0 settlement. 9. How do you feel with this small victory of yours? Is it better to fight or settle the cases? Victory always feels good. This is the 4 time we have tasted it. First my mom won Permanent Injunction suit. Then my wife filed a case to get my passport impounded, which i fought PIP and i won it in court as well as in RPO(Regional Passport Office). Then she filed DV which was dismissed i.e. DID and then she filed restoration which has been dismissed on merits. 10. What has been your biggest learning point in this journey? How have these cases changed you as a person? Biggest learning point is not to trust WOMEN Blindly. Its a part of misandry to trust females without knowing them. Yes, absolutely i have learnt about the law of our land and got to know how our biased system works. And i took decision to always help others in their fight against false cases. Editors’s Note: It is a common observation that in a lot of matrimonial disputes, complainants themselves do not appear in the court. I wonder who is asking for Justice here? When the complainant herself is not bothered about her complaints one can deduce the seriousness and veracity of that complaint. Irony is courts keep on giving dates after dates even if the woman doesn’t appear in courts. Failure of appearance by the man’s side however can lead to many repercussions. If this is not bias then what it?